* Preheat the oven to 230°C, gas mark 7. <The day before you roast>Remove excess rind but remain thin layer of surface. Score finely on surface. Season with sage, thyme and salt and pepper. Wrap with cling film and keep in the fridge for overnight. Leave at a room temperature 1~2 hours before roasting. Pat with kitchen paper to remove the moisture. In a roasting pan scatter the vegetables and lay the pork. Drizzle with oil and sprinkle with salt and pepper. Roast for about 30 minutes in the preheated oven with 230°C, gas mark 7. Meanwhile, to make apple sauce drain the apple from the salted water. Heat the apple, water and sugar. Bring to simmer and cook for about 10~15 minutes over a low heat. In a small bowl mix well with corn flour and 2 tbsp water with a spoon. Add the corn flour into the sauce to make thicken sauce. Reduce the heat to 180°C, gas mark 4. Turn upside down the vegetables and keep roasting for about 1 hour or until cooked. Take out from the oven and cover with foil for about 10 minutes. 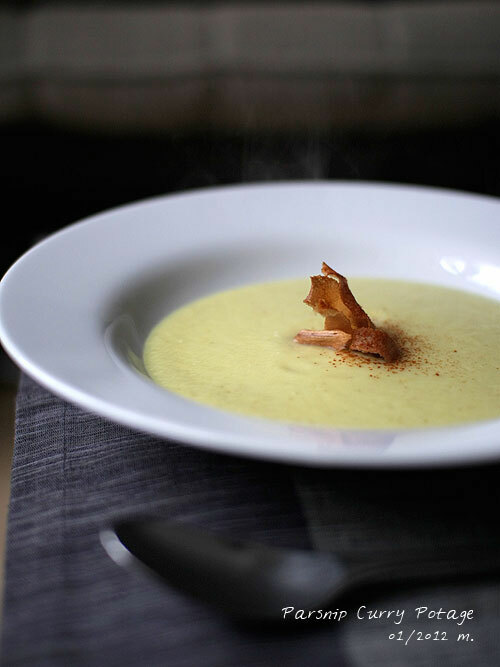 Serve with apple sauce. 3~4 (400g) parsnips, peeled, halved and sliced. soaked in cold water and drained. Heat the butter in a heavy-based pan over a low heat and saute the onion and parsnips for about 5 minutes. Add 600ml hot water and salt. Bring to boil and simmer for about 20 minutes with the lid or until the parsnips are softened. Meanwhile, peel and slice the small parsnip with a peeler. 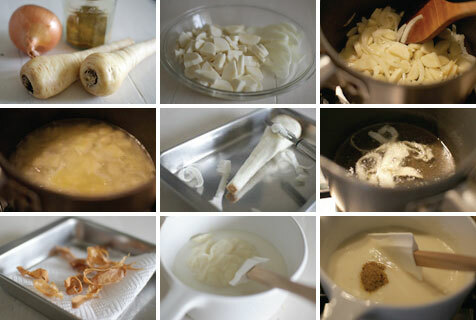 Heat the oil in a small pan over a low heat and deep-fry the parsnip until they are slightly golden. Drain them with a kitchen towel. Blend the soup until smooth and put it back in the pan. Add the milk, curry powder and adjust with salt. Warm it up just before boiling and divide into each serving bowl. 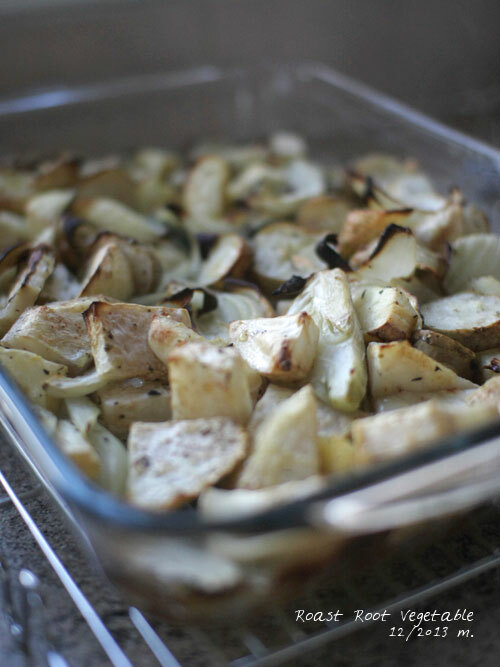 Place the parsnip chips on the top and put a touch of cayenne pepper if you want a kick. 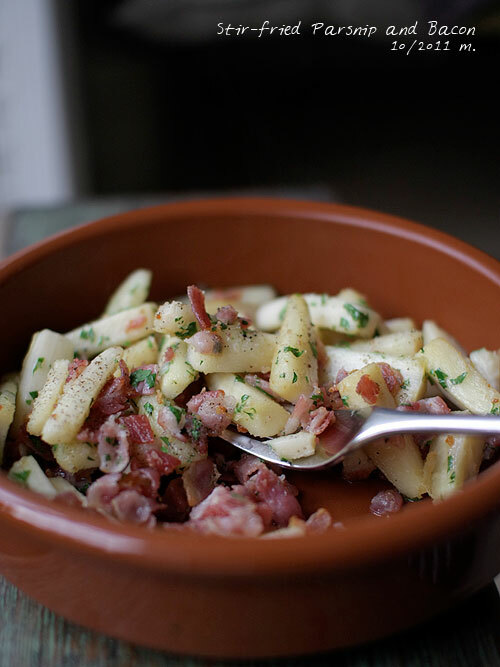 Heat the oil in a frying pan over a low heat and stir-fry the bacon and parsnips. Cook them for about 15 minutes or until they are cooked. Season with salt if necessary and sprinkle with pepper and parsley. Serve immediately.